I'm beginning to wonder if Mina is just exceedingly unlucky, or one of the most accident-prone dogs I know. Today, the hounds and I were all set for a lovely autumnal walk in the local woods. Just as we were pulling into the car park, I heard a yelp from the back of the car. I couldn't determine which hound had made the sound and thought no more about it. All three jumped out of the car and seemed OK, but then I noticed some spots of blood on the bedding. I checked all paws and couldn't see a thing, then Mina moved and I spied some drips of blood by her. On closer inspection I saw that she'd somehow cut her tail through to the tendon. I then started a frenzied look in the car for something to stop the bleeding (boy, can tails bleed) and to bandage the tail with. Unfortunately, the first aid kit was in the other car. Thankfully, I managed to calm myself and get my brain working and went to the little café, thinking they would have a first aid kit. They did, and they saved the day. After bandaging the tail, I called the vet and bundled all three hounds back into the car, vet-ward bound. Mina's tail injury, is the latest in a long line of incidents this year. I'm seriously considering retraining as a vet, as I seem to spend so much time at the vet practice with Mina. This latest visit to the vet cost over £120 and as you can see, poor Mina's tail is completely encased by bandaging. She's feeling very sorry for herself and will be back on restricted exercise until her tail heals. I am beginning to wonder whether I should wrap Mina up in bubble wrap before I let her venture out of the house, as she seems to be so accident prone. She's just so full of life though, and I suppose her injuries are the price she pays for this. If we hadn't insured Mina, we would have had to find over £2,345 to pay for the cost of all these treatments. I don't work for an insurance company and this isn't a hard sell to fellow dog owners to insure their pets, but I hope it does give food for thought. Lots of people I speak to don't insure their dogs, or have stopped the insurance - only for the dog to become ill and then be faced with expensive vet bills. 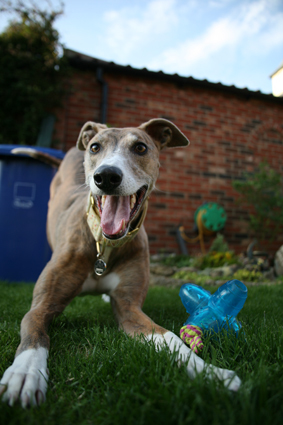 Working with a greyhound rehoming charity, all the hounds that are homed leave the charity with four weeks' free PetPlan insurance. We strongly advise all our owners to take out pet insurance, but many don't and on occasion, come back to the Trust when a dog has injured itself and ask for the Trust to pay. As a small charity, this puts significant strain on finances. 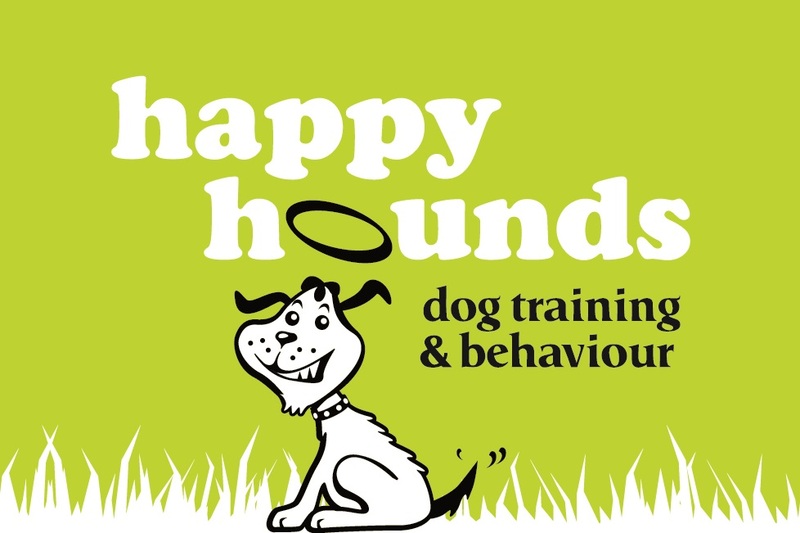 What's more, a lot of people don't realise that if their dog causes an accident or damages someone else’s property, then you, the owner, could be held liable and sued/prosecuted. Most dog insurance policies provide liability insurance to protect against this. I dread to think what the premium will be on Mina's policy when it comes to renew next year, but one thing's for sure: with Mina's track record, I'll be renewing the policy. And, if anyone has any tips on how I can prevent Mina having further accidents, please post a comment. 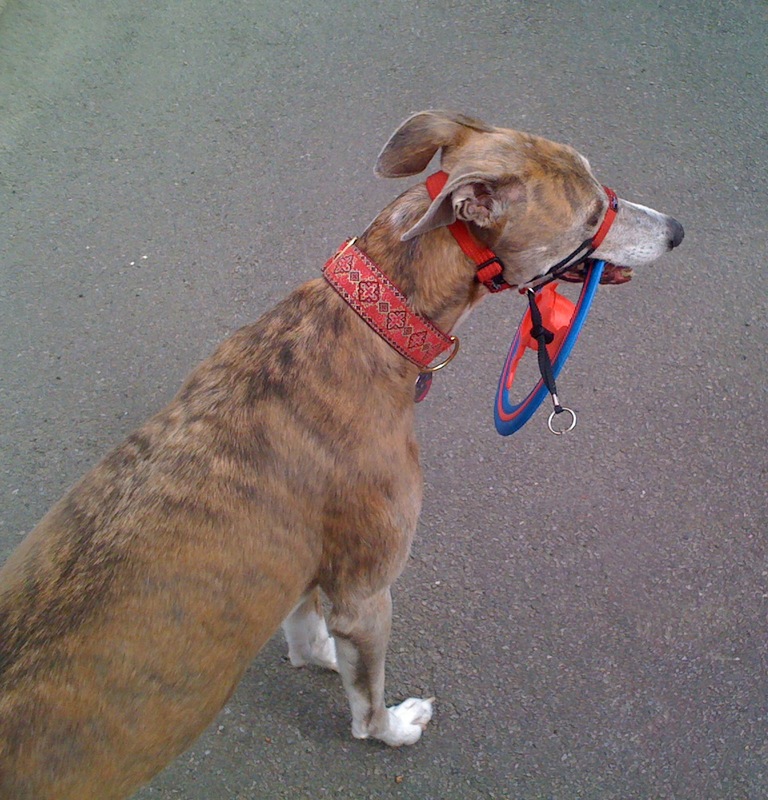 For a greyhound (shhh... we don't tell her that technically she's a lurcher) Mina is pretty good at destroying toys. As earlier blog posts have shown Mina is a Squeaker Seeker and Soft Toy Slayer Extraordinaire. Over the years we've been on a mission to find toys that are 'Mina-proof' and, believe it or not, there are some toys that can withstand Mina's squeaker seeking ways. We've whittled these down to a list of the top 5, virtually indestructible (according to the Minaometer®) toys and thought we'd share them. So, what's made it onto the list? In true Hollywood style, the results are in reverse order. This frisbee is great. Mina can run with it, shake it around, chew it and all without breaking it. The frisbee is pretty easy for me to carry on walks and really does provide a good moving target to retrieve. It's also big enough to see if she does drop it in the field. It would have been higher up the list had it not been for one minor flaw: the domed top of it often comes off. It's easy to clip back on, but is a bit inconvenient. Where would we be without the Kong Classic? This was one of the first dog toys I discovered for Mina - under the guise of a boredom buster to help with separation anxiety. The Kong Classic has been stuffed with kibble, broken up dog biscuits, bits of liver cake and 'plugged' with Kong paste or Primula cheese spread and has helped keep Mina calm and my house destruction free! 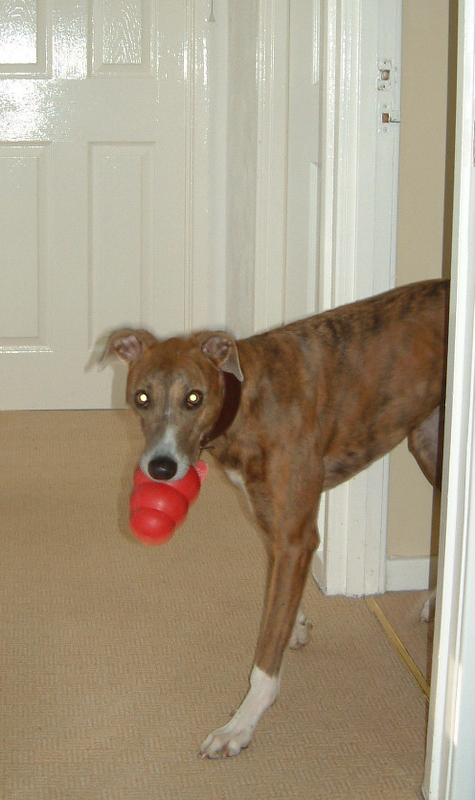 Kongs come in sizes from small to XXL and cost from around £4.80 to £16. For serious chewers there's even an Extreme version in black rubber and there is a range for both puppies and seniors too. Have I mentioned that Mina loves to run, fetch and chase things? Anyone who follows me on Twitter, will know that Mina can be quite accident prone when she's enjoying a run or game, so the Ruff Dawg Stick is a godsend! Mina loves sticks and I'm always preventing her from picking them up as I don't want any splinters or accidents happening, particularly as Mina is so accident-prone. The Ruff Dawg Stick is great - a big rubbery, indestructible stick that Mina just loves. We can play games of fetch, both inside and outside the house, and if it gets mucky, it's very easy to clean. It's also very easy to spot in a field full of autumn leaves - unlike a real stick. The Ruff Dawg Stick costs around £10.99 and in my, and Mina's opinion, is a great buy. Did you ever play jacks as a kid? The kind with a small rubber ball and little metal jacks that you had to pick up? Well, I loved playing jacks and so does Mina, particularly with her Orka Jack. It's not quite the jack you may remember from childhood - it's bright turquoise for a start and has a rope through the middle - but it's just as much fun to play. It's covered in knobbly bits, which Mina loves to chew, and the rope allows it to be used as a tug toy too. It's great to throw as well and can bounce a fair distance, whether it's thrown by me or the dog! Mina has managed to un-knot the rope before, but it was easy just to thread it back through and knot it again. When the rope got a bit smelly I popped the Orka Jack in the washing machine and it came out like new. Mina has the large size which costs around £10. I have to say the Pentapull takes a very deserved first place, particularly as it's the only non-rubber toy on the list. I bought it at Crufts in March 2010 and seven months later it's still going strong and is in one piece. Mina just loves it (as does Jasper) and seems to really enjoy throwing it about and playing games of tug. The only real signs of wear and tear are around the duck's neck (awww, poor duckie). All in all though, it has certainly beaten the record for any other soft toys. It is also the most expensive toy on the list and retails for around £16.99 but to me, is worth every penny. It's great to see Mina playing with a soft(ish) toy that lasts and can't have the stuffing picked out of it. So, there you have it: a list of toys - all tested by Mina - and all still going strong after months and even years. We've just found out about a brand of toys called Skineez, which I'm trying to find for sale in the UK. They look exactly like the sort of toy Mina would love - flattened versions of rabbits, squirrels etc (not real ones - I hasten to add). Mina and I would love to know what toys your dogs like, so don't be shy and please leave a comment.